Zimbabwe's President Blames 'Vandals' For Killing Cecil The Lion : Parallels President Robert Mugabe made his first public statement about the lion, saying his compatriots must protect their country's natural resources from foreign "vandals." In a speech on Monday, Zimbabwean President Robert Mugabe said his compatriots failed to protect Cecil the lion. In a speech marking Zimbabwe's National Heroes Day on Monday, President Robert Mugabe said Zimbabweans had failed in their responsibility to protect Cecil the lion. "Even Cecil the lion is yours," he said. "He's dead, but he was yours to protect and you failed to protect him." The lion with the distinctive black mane was shot with a crossbow by Minnesota dentist Walter Palmer, who's said to have paid $50,000 for the hunt. It's been reported that the lion, who wore a GPS collar and was part of an Oxford University research study, was lured out of Zimbabwe's protected Hwange National Park before being killed. 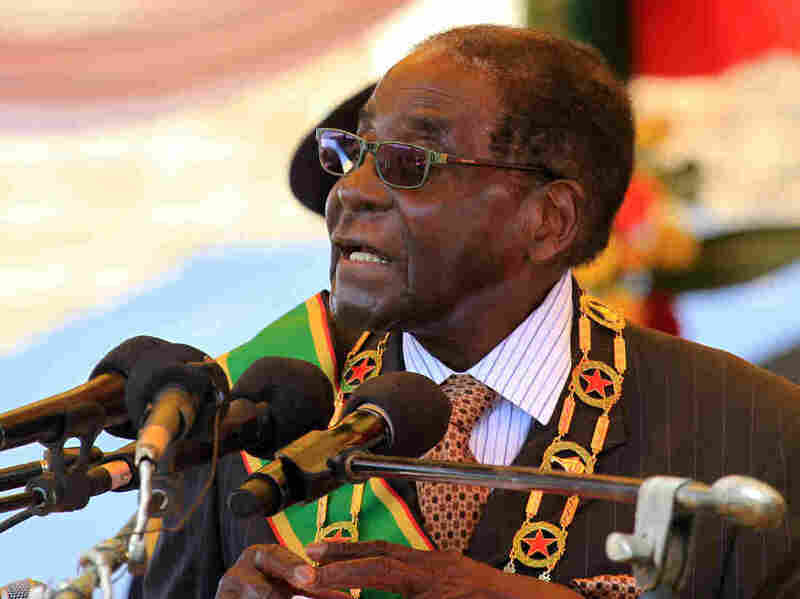 Mugabe, 91, said Zimbabweans must protect what he called their country's natural resources from foreign "vandals" seeking to damage and exploit them. "Some may be just ordinary visitors," Mugabe said, "but others want to vandalize, to irregularly and illegally acquire part of our resources." Not that Mugabe himself appears to have the best track record on wildlife issues. It was reported widely that baby elephant was among the wildlife dishes served at the lavish lunch marking President Mugabe's 91st-birthday celebrations in February. The killing of Cecil has sparked an international outcry and a backlash against big game trophy hunting. But some commentators wonder why this story about an animal is attracting global headlines while Zimbabwean people struggle with so many problems, including high unemployment, economic strife, poverty and political repression. Nevertheless, Zimbabwe's environment minister, Oppah Muchinguri, says Palmer, the American, must face justice. "Unfortunately, it was too late to apprehend the foreign poacher, as he had already absconded," he says. "We are therefore appealing to the responsible authorities for his extradition to Zimbabwe, so that he be made accountable for his illegal action." Muchinguri says Zimbabwe is seeking Palmer's extradition from the United States.